File Photo: Soltron, one of the bands that will be playing at Roccapulco for a benefit for Mexico and Puerto Rico this weekend. Local band Soltron will play at the Mission Cultural Center for Latino Arts this Friday to mark the release of its self-titled album celebrating the Mission District’s culture and exploring themes of gentrification and displacement. Soltron began as a trio of drummers in 2014 after percussionist Anthony Sierra went to Cuba, where his father is from, to study the batá, a set of three drums primarily used in the country’s religious ceremonies. “When I came back, I was looking for people to play with because I knew that I wanted it to be an element in a band that I was imagining,” Sierra said. He later met and began playing batá with Akheel Mestayer and Remi Spiro. Before long, the band grew into a group of 12, with people on guitar, bass, drums, flute, saxophone, trumpet, trombone, electronic wind instruments, and vocals. Many members are alumni of Ruth Asawa San Francisco School of the Arts and the Latin Jazz Youth Ensemble of San Francisco. All are fighting to keep the neighborhood’s cultures and traditions alive during a time characterized by rampant gentrification and displacement. Many are politically active: In May, Mestayer led a hunger strike at San Francisco State University that successfully fought the elimination of the Ethnic Studies Department. Sierra recalled working at the Sprint store at 23rd and Mission for many years before moving to the T-Mobile store. He described watching the economic and demographic changes in the neighborhood up close, and cited a study conducted by the Council of Community Housing Organizations and the Mission Economic Development Agency that found 8,000 Latinos have been displaced from the Mission since 2000. Sierra currently lives in San Juan, Puerto Rico, where he records and tours with a band that shares Soltron’s ethos. The Mission continues to change more and more every time he goes back, he said. “It felt like it was on us to preserve the culture and double down on who we are and what we represent,” said Daniel Riera, the band’s flute and wind synth player. “What brought everybody together was some ideals that were…much bigger than any of us individually,” Sierra said. 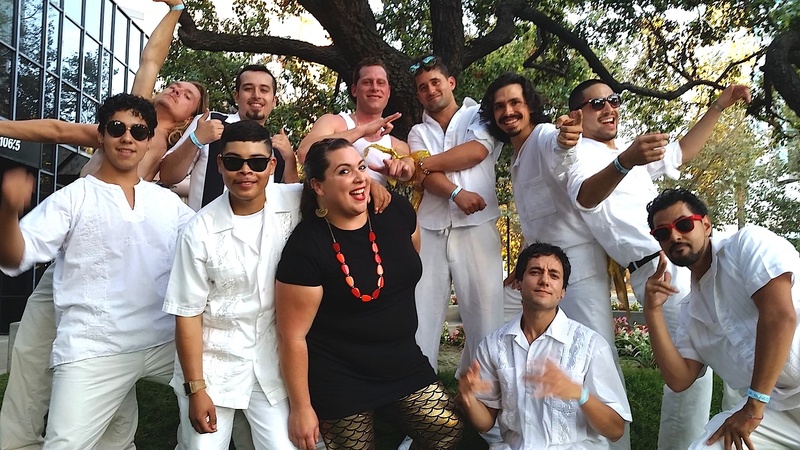 Soltron’s music combines contemporary styles with disparate Latin genres that reflect the pan-Latin culture of the Mission District. Riera noted that many band members’ parents are involved in the Bay Area’s music scene. His father, Arturo Riera, is a Latin music promoter who helped co-found the Latin Jazz Youth Ensemble of San Francisco alongside his mother, Sylvia Ramirez, and others. Remi Spiro’s father, Michael Spiro, is a well-known percussionist and Manolo Davila’s parents helped found the Mission Cultural Center, he said. Community support enabled the band members to surpass their original fundraising goal and record their new album in a professional studio for the first time, where they collaborated with music engineer Carlos Alvarez and producer Greg Landau, both of whom have worked with high-profile Latin artists. The album comes with a comic book titled ‘The Awakening,’ which tells the band’s story through illustrations by San Francisco artist Camille Mai. The release party concert is on October 21 at 7:30 p.m. at Mission Cultural Center at 2868 Mission Street. Soltron’s music is available on Bandcamp, iTunes, Spotify, and Pandora.